the treatland super computer found 43 results matching your criteria. HERE NOW! three NACHI 6203 C3 bearings and one 6203 NR snap ring bearing and three e50 green seals for rebuilding e50 (one speed) engines on any puch moped. HERE NOW! three NACHI 6203 C3 bearings and one 6203 NR snap ring bearing and three e50 viton seals for rebuilding e50 (one speed) engines on any puch moped. this is the bigger of the two bearings that are embedded in the clutch side of the ZA50 case, you know what i'm sayin. 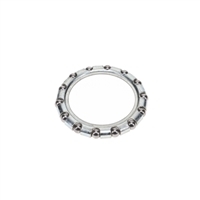 this is the bigger of the two bearings that are embedded in the clutch side of the ZA50 case, only this time its the malossi version, you know what i'm sayin. 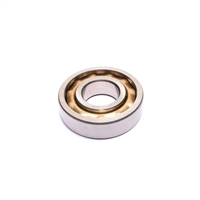 original replacement bearing for tomos or anything you need to use it on!!! middle case counter shaft bearing for the puch ZA50 case. ok, got it? FAG nylon L17 bearing for rebuilding puch ZA50 two speed engines! FAG, not some bargain basement junk. special reinforced super version of the FAG 6203 TB P63 C3 bearing by FAG of portugal. developed for super hi rpms, i think you have experienced these right? yes. good. deluxe NACHI version!!! if you aren't aware, nachi is makes some of the highest quality bearings in the world! full bearing and cup set for puch forks. for MAXI! full bearing and cup set for tomos. bearings cups fit puch magnum and all the other puch tube frames! 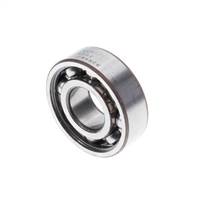 use these to convert puch snowflake wheels from loose bearing to sealed bearing! convert your hobbit front 5 star mag to 12mm axles with these too! caged headset bearings for puch magnum/freespirit headset and some tomos, check first to be sure this is the size you need. buzzetti full bearing and cup set for puch forks. for MAXI! buzzetti caged headset bearings for puch, vespa, peugeot, motobecane and maybe more, check first to be sure this is the size you need. complete OEM head set package! mike thomas of arizona developed and created a NEW NEW NEWWWW front disc brake set up with custom machined hub for the puch 5 star mag wheel! this is the smaller of the two bearings that are embedded in the clutch side of the ZA50 case, you know what i'm sayin. so there are two different puch ZA50 clutch side covers with different size bearings. so be aware. check the measurements. depends if you have the ZA50 with oil injection or no oil injection. ok. more details to come. this is the smaller of the two bearings that are embedded in the clutch side of the ZA50 case, you know what i'm sayin. so there are two different puch ZA50 clutch side covers with different size bearings. so be aware. check the measurements. depends if you have the ZA50 with oil injection or no oil injection. just the center bearing spacer for the mike T disk setup! olympia 11mm moped axle. perfect for puch front wheels! use for front or rear wheels. and for mounting any loose bearing front wheel in wide forks. this axle has more threading in the middle so it will be no trouble to fit most all mopeds that use an 11mm axle. HERE NOW! 100 pack of loose ball bearings. use em for something. wheels, headsets, or whatever you can. measure first. these are carbon steel bearings, grade 200! choose your size - 1/8", 3/16", 5/32", 7/32", 1/4" and 5/16"